Hands of Gods are travellers’ top spot in Vietnam! Vietnam’s incredible ‘Golden Bridge’ is all over social media right now so how can you get there with Wendy Wu Tours? Over the weekend, Vietnams impressive new ‘Cầu Vang’ bridge made its way across the internet. Also known as the Golden Bridge, images and stories of the new attraction captured the attention and imagination of travellers across the globe and it’s easy to see why. The new pedestrian bridge makes a bold visual statement resembling two gigantic stone hands raising a golden thread into the clouds. The Golden Bridge is already attracting scores of visitors and will continue to do so but what is it all about? Where is it? And how can you get there with Wendy Wu Tours? The Golden Bridge is fresh! It just opened in June this year, so it’s no surprise that locals and globe trotters alike are clamouring to be the first to experience both the impressive views of the misty Bà Nà Hills and the massive scale of the stone hands elevating the bridge. The ‘‘Cầu Vang’ was built to help welcome visitors to the increasingly popular Bà Nà Hills in the Da Nang region of central Vietnam. 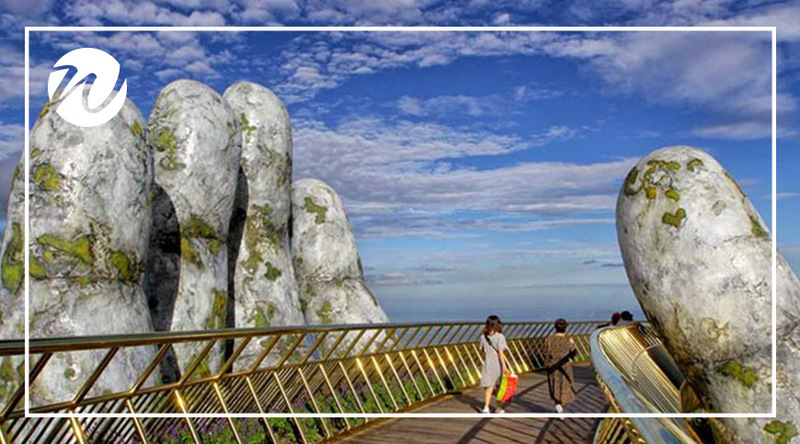 Designed by local architects based in Ho Chi Minh City, the stone hands are made to look ancient and weathered evoking an image of a strip of gold being pulled out of the land by the giant hands of gods. For travellers and locals in Vietnam, the Bà Nà Hills are a hidden gem. Only a day trip from the charming UNESCO town of Hoi An, the mountains are steeped in history, beautiful vistas and are the perfect place to escape the heat and humidity of South East Asia. During the French occupation of Vietnam Bà Nà Hills was a dedicated Hill station where colonial administrators could retreat to escape the intense summer heat. 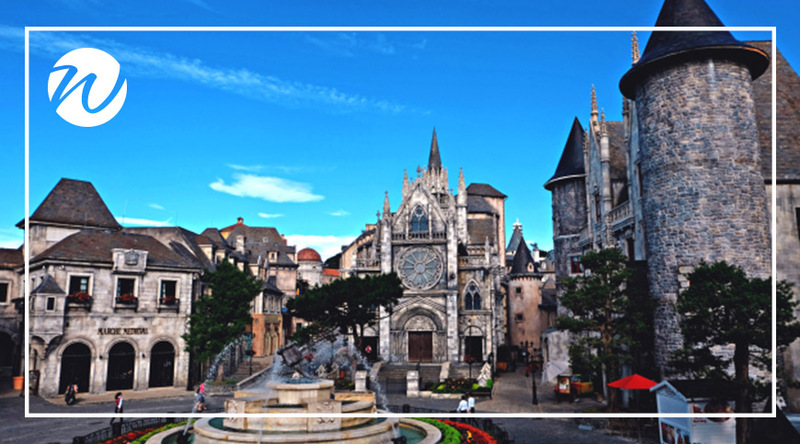 Hill stations are peppered throughout colonial Asia; however, the Bà Nà Hills have been restored and reimagined to showcase the unique French style architecture and the surrounding landscape. 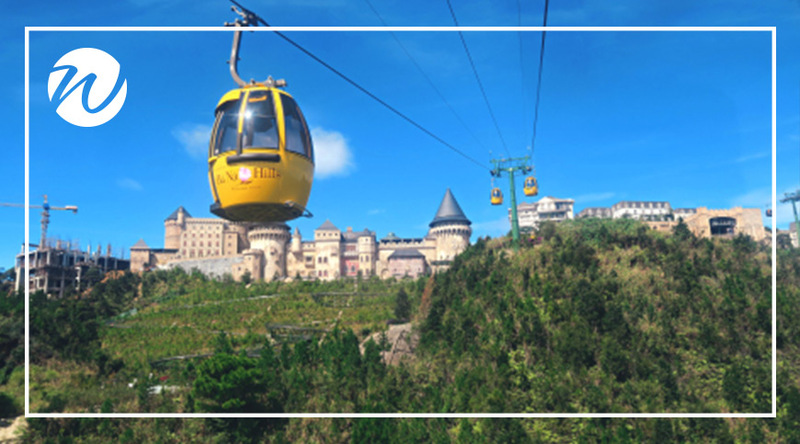 The Golden Bridge joins a growing list of attractions in the Bà Nà Hills including the world’s longest non-stop single-track cable car, a medieval resort, and the Linh Ung Pagoda. How can you get there with Wendy Wu Tours? You can experience the Bà Nà Hills Golden Bridge with a Wendy Wu Tours Tailor-Made Holiday. This style of holiday is perfect if you are looking for a unique and flexible itinerary, and the freedom to see and experience whatever you want with none of the stress of having to plan it yourself. Tell us where you want to go, what you want to do, and we can organise the details. So, what are you waiting for? Check out our Tailor-Made Holidays and start planning your bespoke trip to Vietnam. Be one of the first to experience the majesty of the Bà Nà Hills and the Golden Bridge. Not sure where to start? visit www.wendywutours.com.au for inspiration or call 1300 727 998 to speak to our Asia experts. Asia Travel Myths – Dismissed!